ELIDA farm and The Specialty Coffee Association of Panama (SCAP) are happy to announce that The Best of Panama (BOP) 2015 auction registration is now open. Geisha Washed qualified for the auction. 6 of 7 coffees placed in the competition, and 7 of 7 qualified fot the BOP 2015 coffee auction. Boquete coffees are considered among the best in the world. At the turn of the century Kentucky born Robert Lamastus started an Arabica coffee plantation in a farm located at around 5,600 ft (1 700 m) above sea level in the skirts of the Baru Volcano in Boquete, Panama. At the time our grandfather processed and exported what is still today considered as one of the highest quality coffees in the world. Now a days and two generations later the tradition continues, the Lamastus family, still produces, processes and exports its own rare estate coffees. The Lamastus, produce these estate coffees in two different farms located in Boquete, Panama. El Burro Estate and Elida Estate. These two estate coffees are located in the highest area of the country in steep hills in the skirt of one of the highest volcanoes in Central America, the Baru Volcano. El Burro Estate is located between 5,200 and 6,500 ft (1.575 and 2,000m) above sea level and Elida Estate is the highest coffee farm in Panama located between 5,500 and 8,200 ft (1.700 and 2.500m) above sea level. Both of these estates are planted with Arabica coffees in rich deep young volcanic soils and are kept in optimum conditions to develop the best quality coffee that the trees can produce. The cherries are delicately hand-picked, at strict full maturity, by native Ngobe-Bugle Indians in an area where our main objective is to keep the environment to its most pristine and natural condition. The coffee is then washed processed with most care to keep the rich flavour of the coffee. Then, the coffee is carefully selected, rested for 60 days in burlap sacks on wooden floors and then exported directly by the Lamastus family. In these estates, Estate only, the area that goes up to 6,000 ft is planted with coffee (in Panama coffee cannot be grown at altitudes higher than 6,000 ft) and the other part is an ecological reserve area, located within the Volcan Baru National Park, where you can go bird watching and see many beautiful plant, animals and bird species including the Quetzal. Because of the high altitudes where the coffee is grown the beans are very dense and uniform and they are mild with a medium body, good aroma and high acidity. These estate coffees are considered among the best in the world. 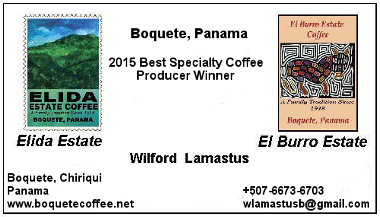 These rare specialty coffees are available by contacting us in Boquete at the address shown below.